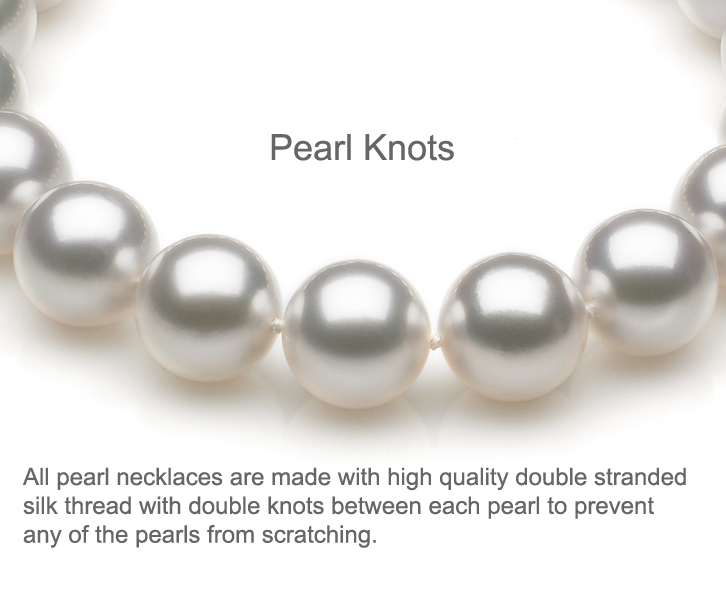 At American Pearl, we want you to know that whichever cultured Akoya pearl strand you choose, you can be sure that the pearls on your necklace will be guaranteed Japanese Akoya in origin (not Chinese), and the surfaces of the pearls will be unblemished or what we call in the industry clean. Many sellers offer Akoya pearls to consumers that are Chinese in origin (when consumers think they are paying for the finest quality Japanese Akoya) without clarifying their origin. 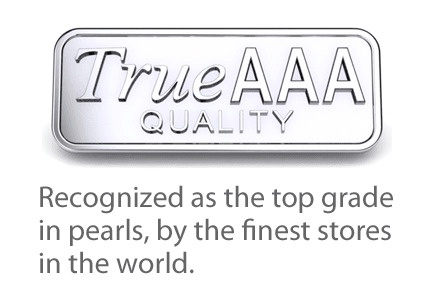 In addition, American Pearl adheres to the The Mikimoto Pearl Grading System where surface perfection or a blemish free surface found in the TRUE AAA quality is the key to the most valuable and best quality pearls in the world. 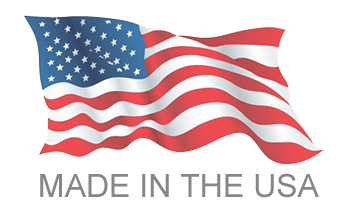 American Pearl is staffed by a team of pearl experts who can answer all of your pearl-related questions, whether regarding quality, size, origin or price. If you're wondering how to spot top-quality Akoya pearls and to make sure you're getting an authentic product, read more here. 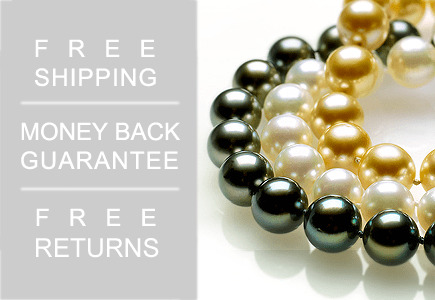 When most consumers purchase Akoya pearls, they expect to get Japanese Akoya cultured pearls. Why do they expect Japanese Akoya, you might ask? Because the most well-known, highly- respected sellers of cultured pearls in America (including Tiffany & Co. and Mikimoto) have been exclusively selling Japanese Akoya cultured pearls for over a century and calling them "Akoya." Although Chinese Akoya pearls have their place in the consumer market, they are not yet considered investment- grade and the long-term durability of them is still unknown as they are new to the market. Whereas the vast majority of Japanese Akoya cultured pearls exhibit very high luster, thick cultivation and sharp reflections, most Chinese Akoya cultured pearls have thinner cultivation and lower luster. Consumers should know that just because pearls may be called "Akoya", they are not necessarily from Japan. One should always determine the true origin of their "Akoya cultured pearls" and sellers should draw a clear line in the sand between "Japanese Akoya cultured pearls" and "Chinese Akoya cultured pearls". American Pearl does not deal with heavily blemished, marked pearls. Blemished pearls whose surfaces show imperfections or spots are worth half the value of perfectly clean pearls. Because the pearls we purchase from our farmers consistently and continuously for the last 50 years are the top 1 percent of the harvest, you can be sure that the pearls offered to you from American Pearl are indeed finer and cleaner than any pearls offered to you from an outside source. Not only that, but we're able to sell our pearls at excellent prices with free shipping so you're able to share in the splendor of cultured pearls without breaking the bank. * The strand of pearls shown in the picture above are white b ody color. As you can see from the close-up, each pearl is strung on double-stranded silk thread with double knots to cushion the pearls. This is the same stringing technique used by fine jewelry stores such as Tiffany & Co. and Mikimoto. As America's leading pearl company, it has become the mantra of our founder, Charlie, to offer our customers the cleanest, finest quality pearls in the world to honor the reputation we have earned through the cleanliness of our pearls. Over the 50-plus years Charlie has been in the business, he has built long- standing relationships with pearl farmers all over the world. 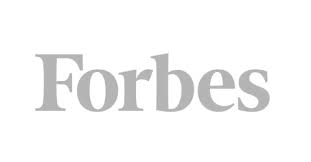 Relationships that go beyond business. Charlie has been true to his suppliers regardless of market conditions, and as a consequence, the farmers gather and safeguard their finest pearls for American Pearl. 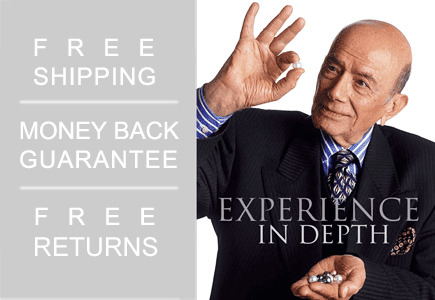 When you purchase pearls from American Pearl, you are guaranteed to purchase pearls that are finer quality than others, as they were selected first. Yet, why are we so insistent in boasting about our pearls' superior quality and clean surfaces? Time and time again, consumers unknowingly purchase pearls they think are fine quality, yet overlook the most critical factor: the pearl's surface. Purchasing a strand of pearls that is blemished is like buying a stock without knowing its price. 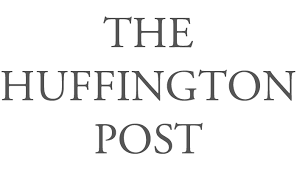 Or consider purchasing a piece of real estate without knowing its location. The analogy is the same for pearls, except this time, it is cleanliness of the pearl's surface that is the key factor in determining its value. 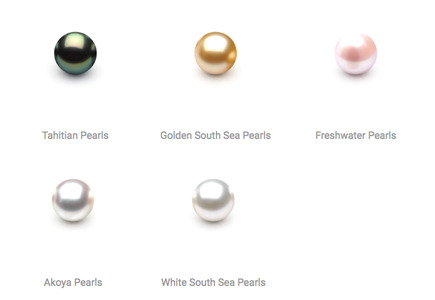 If you look closely at the pictures of the round pearls on our website, you'll notice the pearls are clean. A wise consumer will insist that the pearls on their necklace are perfectly round, perfectly clean and matched for color and luster. The composition of a perfect strand of pearls is an art that we have perfected for over 50 years of pearl trading. A Note on Pearl Body Colors and G.I.A. In addition to selling you clean pearls, American Pearl is renowned for selling you the whitest body color pearls with your choice of a silver or rose overtone when dealing with Akoya Pearls and South Sea Pearls. American Pearl does not sell you yellow creamy pearls. White body color pearls (with your choice of silver or rose overtones) are the most valuable body color pearls in the marketplace compared to their light cream counterparts. Many consumers unknowingly purchase a strand with a slightly light cream or yellowish body color to the pearl, which are worth considerably less. In fact, according to the Gemological Institute of America, pearls with a light cream body color are worth 40 percent less than pearls with a white body color. So examine the pearls you are considering very carefully. Are they creamy? Yellowish? Or are they white? Of course, the color of a pearl does not affect its quality, it simply affects the price of the pearls. So if you are looking for creamy pearls, that's finest, just make sure you pay less for them. When examining a strand of pearls, it is advised that you do so under a controlled setting for grading pearls. 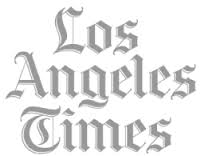 The Gemological Institute of America, through their coursework and literature, recommends that you always examine your pearls under a fluorescent light against an either white or grey background. A glass surface is the least effective area on which to examine pearls as the body color of the pearls in question is difficult to detect. In fact, when the owners of American Pearl sell their pearl s to Tiffany & Co., it is our experience that they always use a fluorescent lamp for grading. This setting creates a neutral environment where the nuances in body color, f rom white to light cream, c an be identified. Because a pearl's surface is so reflective, one must consider very carefully the light source used to examine and grade pearls. One should be particularly skeptical of an incandescent light source used for the grading of pearls. Incandescent light, by its very nature, shows a fuller distribution of color from the color spectrum. When used in the grading of pearls, one may be associating attributes to the reflective qualities of the pearl's surface that are in actuality originating from the light source. This pearl mirage does not take place under fluorescent lights. The most valuable lesson to be learned here is that upon the examination of pearls, make sure you are grading the pearls, not the light source. The quality and awe of a fine quality pearl seen under a fluorescent lamp will be obvious. Because pearls have hundreds of concentric layers of skin (what we call nacre) that are translucent, reflecting light as well as allowing light to pass through each layer, a "play-of-light" is achieved on the surface of a pearl which gives pearls the very qualities for which people have marveled in awe over them. It is for this reason that pearls with body colors of white are featured at American Pearl, Tiffany & Co. and Mikimoto. They are the most valuable in the world.